Now that TRAI has taken to announcing fastest speeds of networks on a monthly basis, networks are gearing up for an intense speed war. And it seems, round three of this battle has Jio on top again with TRAI speed tests showing Jio as the fastest network! 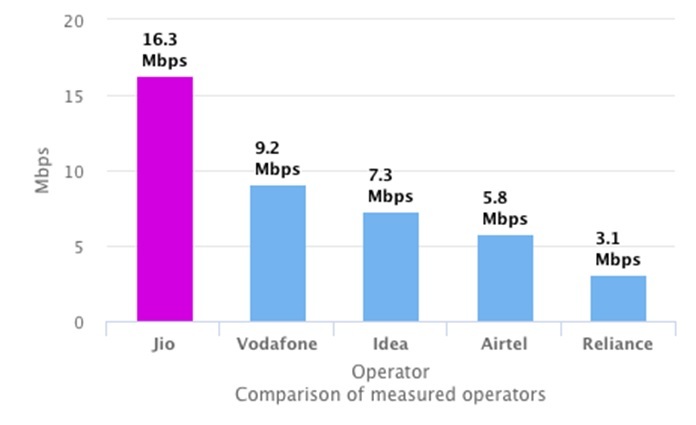 According to the latest data from TRAI’s MySpeed portal, Reliance Jio is the fastest 4G telecom operator in India offering an average download speed of 16.3 Mbps. 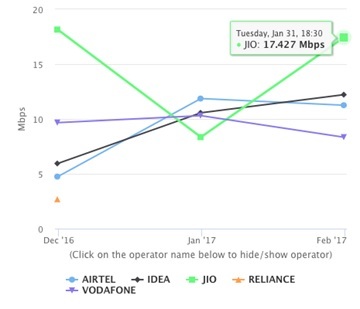 A detailed analysis of the speed test found that Jio was back to it’s top position while Vodafone and Idea were at #2 and #3 with Airtel trailing at number four. 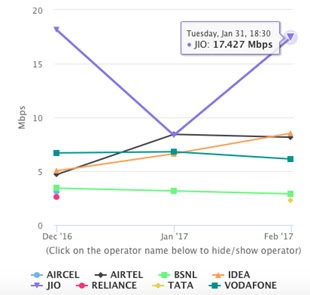 The tests, which were carried out on 6th March 2017 shows that Jio is currently on top with 16.3 Mbps followed by Vodafone and Idea providing 9.2 Mbps and 7.3 Mbps respectively. Airtel does not even make it to the top three as it currently offers a meagre 5.8 Mbps 4G speed just ahead of RCom’s 3.1 Mbps. As you can see, Jio has come out on top in both these speed-test analyses. Jio does not need any backup speed to help boost its numbers. competition to its competitors like Airtel, Idea and Vodafone in terms of speed as well as offers.